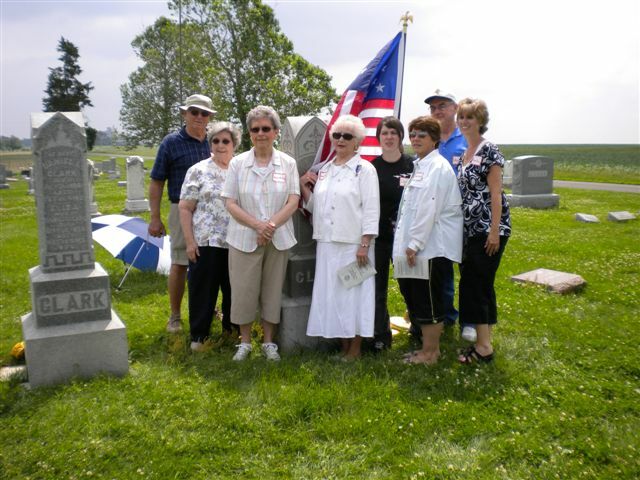 On June 13, 2009, the Sangamon River Chapter of the United States Daughters of 1812 joined descendants of John Winans Clark and guests at Laenna Cemetery outside of Chestnut in Logan County for a Dedication Ceremony to mark the grave of Clark as a Veteran of the War of 1812. John Winans Clark served in Captain Jeremiah Martin’s Co. in the Kentucky Mounted Volunteers during the Clark migration from New Jersey to Illinois. Clark is one of at least 28 veterans of the War of 1812 buried in Logan County. He is thought to be the only one buried at Laenna. Thank you so much for this posting. I was researching my ancestor John Winans Clark online and, thanks to your blog and photo, I know that he and wife Nancy Ann are buried in Laenna. John Winans Clark is my ancestor also. His brother Rev. David Clark is also my ancestor.